When your home or business is in need of furnace repair, it’s a great convenience to know exactly where to turn for service and satisfaction you can trust. Not only does that take the hassle and stress out of furnace repairs, but it gives you the peace of mind of working with a furnace repair company that has your best interests at heart. That’s how we’d like each of our customers to feel when they call us at Hughes Air Heating & Cooling. We want to be the HVAC team you rely on for furnace repair service and any other property heating or cooling concern you have. In Mesa, Scottsdale, and Chandler, our furnace repair pros are simply your best bet for detailed workmanship and superb customer service job after job. Make us your first call for routine or emergency furnace repair. While we love to get repeat calls from satisfied customers, we encourage you to simplify your furnace repair service even further by signing up for a maintenance contract. That way, whenever furnace repair problems arise, we’ll already be familiar with the type of system you own and how it’s been serviced in the past. Best of all, you stand a good chance of reducing furnace repairs when you let us attend to your heating equipment on a regular basis. 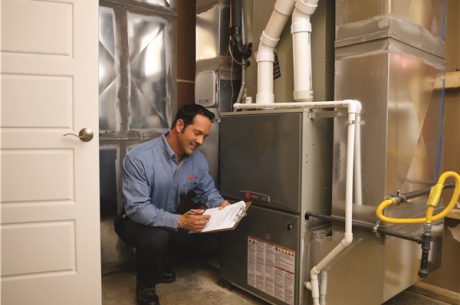 Your annual furnace repair and tune-up is included as part of your maintenance agreement, so you’ll never fall behind on giving your hardworking furnace the quality upkeep it deserves. Who better to turn to than a Trane Comfort Specialist for your furnace replacement or installation? After all, Hughes Air Heating & Cooling specializes in new furnace installation and sales of Trane’s XV product line, meaning we can match you with some of the best heating systems available. We’re proud to have been named a Trane award-winning company in 2015 for our exceptional furnace installation and repair services. When you’re choosing the technology that will heat your space for many years to come, it’s smart to start with a furnace replacement company that can bring you elite products and proven expertise. Call us to speak with our furnace installers about what you should be looking for in a new furnace or replacement system. We’d love to help you find the Trane product that’s just right for your Mesa-area property. Come see for yourself why Hughes Air Heating & Cooling is one of the most reliable furnace repair companies and furnace installers in the neighborhood. That’s what you get when you combine precision workmanship with decades of experience and quality, brand-name equipment. Give us a call now!